Can Residents Safely and Efficiently Be Taught Single Incision Laparoscopic Cholecystectomy? Introduction: Single Incision Laparoscopic Cholecystectomy (SILC) has recently emerged as a viable option for selected patients undergoing gallbladder removal. While several studies have concluded that this technique is safe when performed by experienced surgeons under controlled conditions, there are no studies evaluating the learning curve for incorporating SILC into resident education and the effect on OR efficiency. Methods: Clinical chief residents (PGY V) were evaluated from June 2009 through August 2010 by a single attending surgeon facile using SILC techniques. Similar to standard surgical education, residents were transitioned from assistants during their first three SILCs to primary surgeon for the remainder of their experience during their 8 week rotation. Demographics and patient outcome data were recorded in a prospective database for each resident. This was compared to data from standard laparoscopic cholecystectomies and attending surgeon outcomes. Results: 7 PGY V residents were evaluated over the time period. A total of 49 SILCs were performed (mean number of procedures performed: 7; range: 5-12). 4 conversions to standard laparoscopic cholecystectomy occurred, all within the first 3 SILCs performed by the resident as operative surgeon. Reasons for conversion included: 2 poor exposure, 1 bleeding, 1 concern for bowel injury. No conversions to open cholecystectomy occurred. Mean blood loss was 25mL, and mean length of stay was <1 day. Average length of operation when the attending was the operative surgeon was 63 minutes. There was an increase in operative time to 75 minutes between the second and third cases performed, reflecting the transition of the attending surgeon from primary surgeon to teaching surgeon role. Operative times returned to those of standard laparoscopic cholecystectomy and attending-performed SILCs by resident case number 5. This was maintained until the end of each resident’s rotation. Factors associated with longer length of surgery were: increasing BMI and presence of acute or chronic cholecystitis. Postoperative complications were uncommon (1 wound infection, 1 urinary retention, 1 incisional hernia) and were not associated with early or late cases along the learning curve. Conclusion: Residents can safely be taught the techniques of SILC with minimal disruption to operating room efficiency. 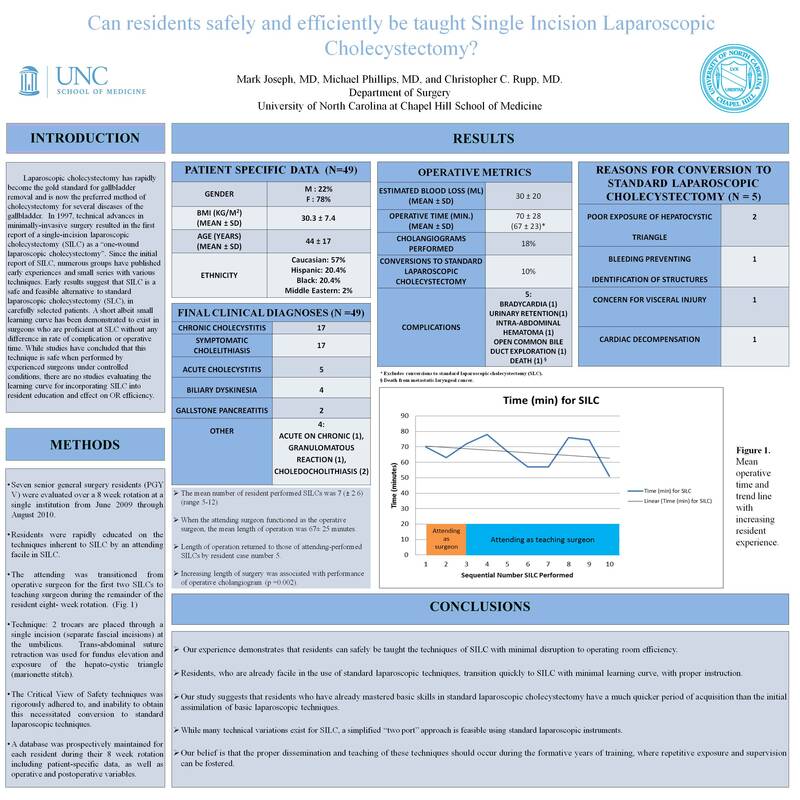 Residents already proficient in the use of standard laparoscopic techniques transition to SILC quickly with minimal learning curve with proper instruction and supervision. SILC can be incorporated into resident education, but whether incorporating single incision laparoscopic techniques into surgical education is superior to dedicated emersion courses for teaching SILC is yet to be determined.